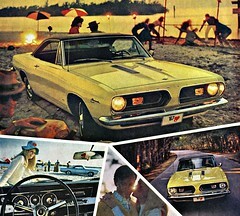 Plymouth Barracuda: They were going to name it what? From the what were they thinking category. Plymouth’s executives had wanted to name the car Panda, an idea that was unpopular with the car’s designers. Well duh, you think? In the end however the person who came up with the name was locked in a closet or ???? 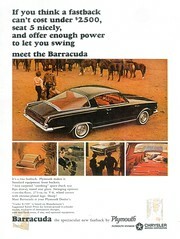 and the, suggestion of Barracuda was selected. Panda???? Can you imagine a guy showing up at a drag strip with a Hemi Panda? Geesh, that would be wrong. 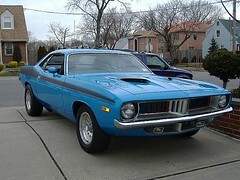 I love muscle cars which is why I picked the Barracuda for this post. Decent copies of the real deal and the promo models are demanding sizable investments. First, a bit of history on the car. The Panda? The first gen was built on the Valiant platform just two weeks before the Mustang but the Mustang was kicking but in sales. It took a while for the Plymouth guys to get this car dialed in. The first gen’s biggest engine only put out 180 hp. Plus, it was still a Valiant with a fastback. Plymouth got the message as the “Valiant” chrome script that appeared on the 1964 model’s trunk lid was phased out on the 1965 model in the US market. For 1966, a Barracuda-specific stylized fish logo was introduced. Hey what other car had a fish logo? Of course I’m going to work AMC in. It was the Marlin. but back to this fish now. 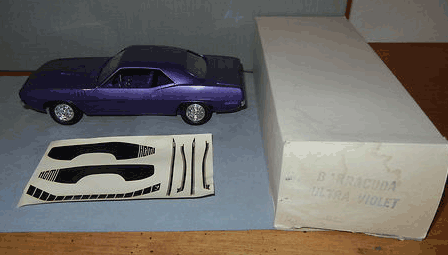 For the second-generation Barracuda which ran from ’67-’69, rode a 108 wheelbase A-body and still shared many components with the Valiant, but was fully redesigned with Barracuda-specific sheet metal styling and its own range of models including convertibles as well as fastback and notchback hardtops. Yea!!!! I actually like this generation’s styling the best. I don’t know why, probably just because it’s cool. The third and final generation E-body Cuda was manufactured from 70-74. It was made in a coupe and convertible and they put gobs of power in it. The Hemi engine pumped out 335 HP. Wheeeeee. The Cuda also had a racing heritage in the Trans-Am series all the way from the first gen to the last. Swede Savage and Dan Gurney raced identical factory-sponsored AAR (All American Racers) ‘Cudas in the 1970 Trans-Am Series. The cars qualified for three pole positions but did not win any Trans-Am races; the highest finish was 2nd at Road America my favorite track. Like s o many other high performance cars, higher fuel prices and performance-car insurance surcharges deterred many buyers as the interest in high performance cars waned. Sales had dropped dramatically after 1970, and while 1973 showed a sales uptick, Barracuda production ended 1 April 1974, 10 years to the day after it had begun. Get out your checkbook if you want a fully restored example, especially the rarer ones. The Barracuda (particularly the 1970-74 E-Body cars) is a collectable car today, with the high-performance versions and convertibles commanding the highest prices. When the Cuda was new there wasn’t a lot of interest resulting in smaller numbers therefore, outstanding examples get high appraisal values today. Original Hemi super stock Barracudas, and similarly configured Dodge Darts are now prized collector vehicles, with factory stock cars commanding high prices. 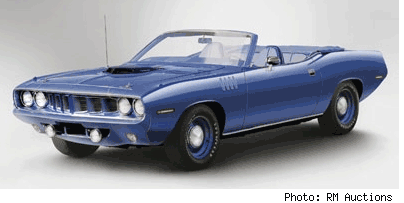 The 1971 HemiCuda convertible, is now considered one of the most valuable collectible muscle cars. Only eleven were built, seven of which were sold domestically, and examples of these cars have sold for $2 million. Oh but not done yet. This example has only 282 miles on it, a shaker hood and is one of only 11 ever built. And in case that’s not rare enough for you, it is one of only three built with the 4-speed manual. It hit the auction block at $4.5 at RM auctions. That’s a lot of cash! I don’t know if I’d even drive it. But for those who don’t have $2M sitting around at home there are the promo models. Again, like the real deal commanding high prices. As with all promo models, the better shape it’s in, the more it’s worth but you also need to take into account what colors they were made in. To get your feet wet in Cuda collecting, I found ’65’s running about 25 bucks. It’s when you get to the later years that the prices start jumping up drastically. In the two examples I found, the red 68 here went for $400 while the 71 went for abound $500. If I had these, they would go right into one of my display cases.